Cycling the Dolomites: "Where your soul longs for more and your legs beg for mercy." 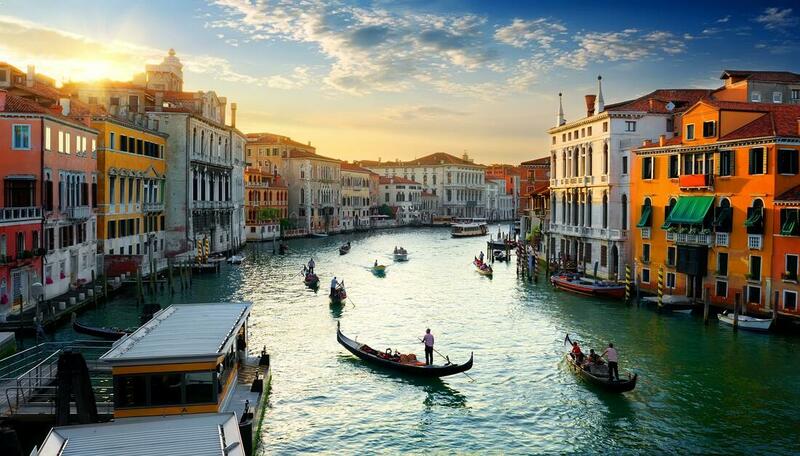 The Air Canada flight from Toronto to Venice lands at 9:10 am on September 15. Store your luggage at the airport and enjoy a day of sightseeing in Venice, one of the most unique cities in the world. There are several options for transport from the airport, including a bus, train, or taxi. Your support van for the week will pick you up at 16:30 at a cafe in Piazzale Roma (lots of signs in Venice lead you to this bus depot/parking lot). We will stop by the airport to pick up luggage, then make our way towards the jagged peaks and scenic valleys that make up the Dolomites. ETA is 19:00 at our final destination where we will feast on delicious Italian cuisine. 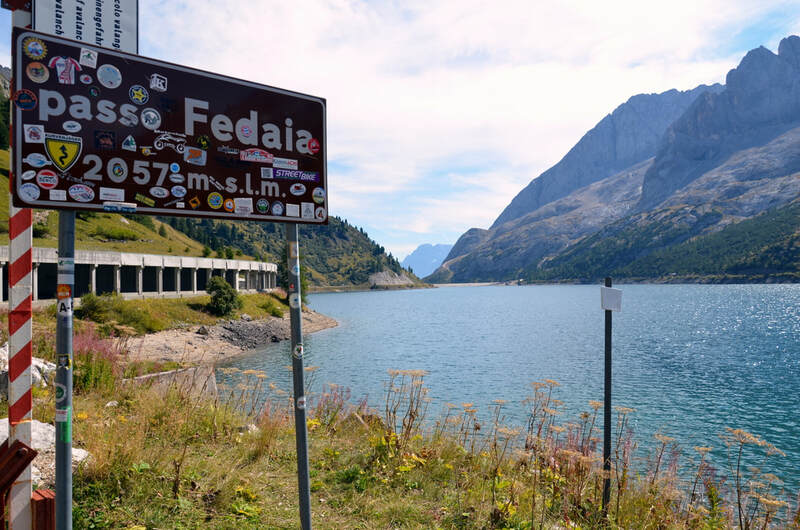 A short warm-up will lead us right in to the challenging Passo Fedaia with its ramps of 12 to 15% and stunning views of the Marmolada, the tallest peak in the Dolomites. Deviate on the Serrai di Sottoguda for a quiet car free road (2 euro entrance fee) and enjoy the solitude of the gorge. 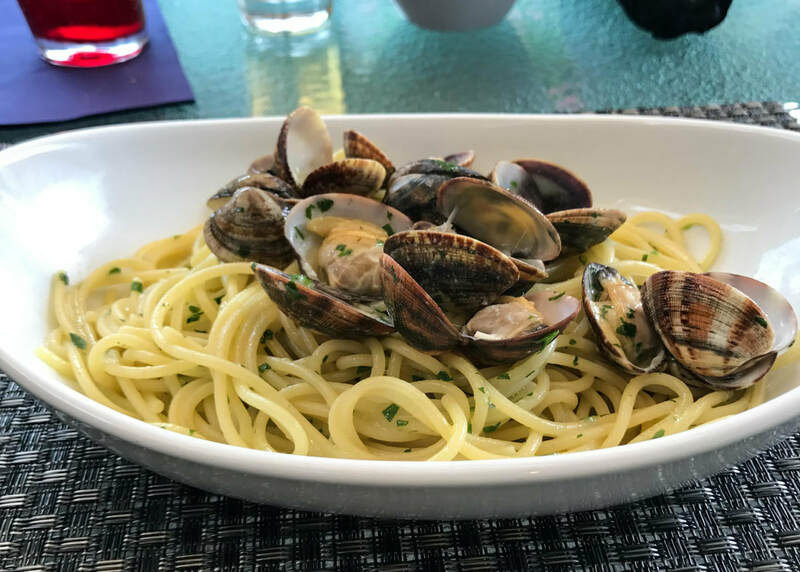 Once in the ski village of Vigo de Fassa, you will need to decide if you want to head back to the hotel or continue on a longer loop to Bolzano. 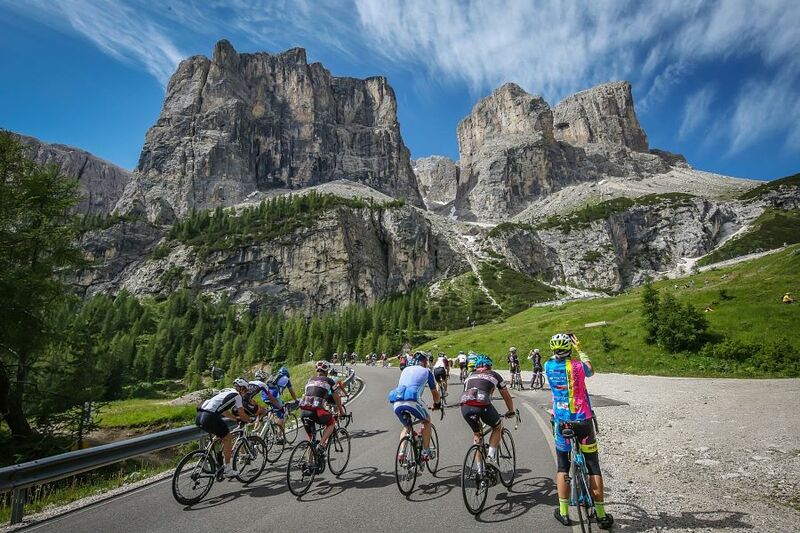 The classic loop around the Gruppo di Sella mountain range is one of the most spectacular bike rides in Europe. The four mountain passes are manageable in terms of gradient and offer dramatic scenery that will awe and inspire. The Dolomites are a UNESCO World Heritage Site after all! 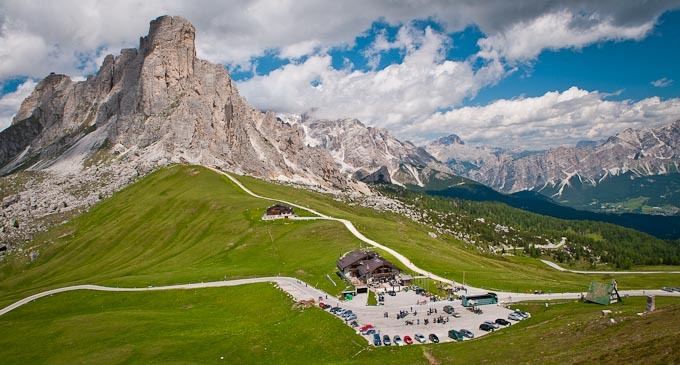 From our hotel, we’ll head over the Passo Pordoi, Passo Sella, and the Passo Gardena before riding through Corvara and on to our final climb the Passo Campolongo and ending with a long descent to Alleghe. A stunningly beautiful one-way ride from Arabba to Villa Santina today takes us towards the Alps and through the beautiful Cortina d'Ampezzo overflowing with 1000s of years of history. We begin with the magnificently epic Passo Giau. With mostly double digit inclines be sure to look around and get distracted by the jagged peaks of the surrounding mountains. We then ride up and over the Passo Tre Croci, through the Sappada valley and over the Cima Sappada before celebrating the end of our ride sipping on local grappa. Suitcases will need to be packed up and loaded in to the van this morning as we will be staying in the Alps this evening. DAY 5. 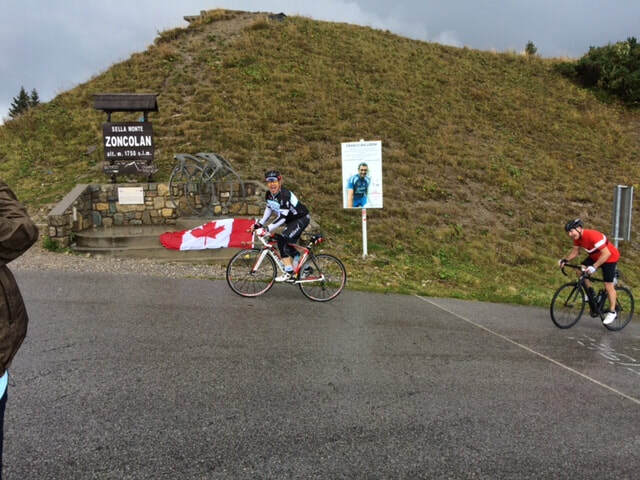 SEPTEMBER 19: MONT ZONCOLAN! Todays ride features the most challenging climb of all the Grand Tours - Monte Zoncolan. At an average gradient of 12%, and most of the climb over 20%, be sure to bring your climbing legs for this Beast of a climb! We will have a bit of a warm-up before our first climb - the infamous Monte Zoncolan. After the Zoncolan summit you will have a choice of descending the same side for a shorter, though still epic route, or continuing on to tackle another HC climb, Monte Crostis, with a total distance of 17.7 km at 5.5% average! After our ride and re-fuelling in Villa Santina, we will make our way to our hotel in Venice. We will have dropped you off at a hotel near the airport yesterday so it will be easy to hop on the hotel shuttle to the airport when needed. Support van with driver who will have a vehicle full of fun snacks, tools, and encouragement when needed! The van will be on-route at pre-determined times to feed and water riders as well as carry or hand out clothing as we go up and over the mountain passes. The van will also carry tired riders and help with basic mechanicals if needed. Rental Bikes; however, we are happy to arrange one for you. Have questions or want to sign up? That part is easy! Simply e-mail Petrina at cyclingcentre@gmail.com.